The South Pacific islands are where Carnival Spirit calls home. Setting sail from Australia year round, she also gives you a fantastic opportunity to get out of the winter cold and warm your bones in an island paradise. View the range of Carnival Spirit’s 7-11 night New Caledonia and Vanuatu cruises from either Sydney or Brisbane or if you have a little more time on your hands, her 12 night Fiji sailings (or 11 nights from Brisbane) will give you the opportunity to discover the hospitality of the Fijian island culture too. Carnival Spirit also offers some great ‘Feature’ sailings, which allow you to combine the fun of the Carnival brand with the overwhelming natural beauty of New Zealand. These 10-12 night New Zealand cruises depart only a few times a year and hurry, they book out fast! 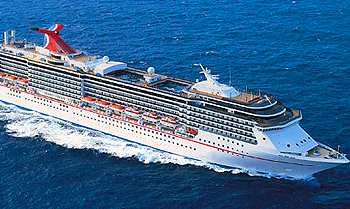 Wanting to give cruising a try, or desperate to test out all that Carnival Spirit has to offer? Why not jump on a three night cruise to nowhere, sailing out of Sydney harbour or Brisbane river , these voyages cruise out and loop back in after three nights of ship exploration and cruising fun. Or, try a four night Moreton Island cruise and venture out to the gem of south east Queensland with it’s pristine crystal blue waters and untouched environment. If you’re hooked and want to see more of what Australia has to offer, book on a Carnival Spirit cruise within Australia visiting stunning ports on Australia’s eastern coastline including Port Douglas, Airlie Beach and Hobart. View the Carnival Spirit’s full range of cruises and book your holiday full of spirit! Or view information and cruises on the Carnival Legend, or view the best Carnival cruise deals including shipboard credit or view more information and options on Carnival cruises. Forget what “they” say – the most important meal of the day is brunch. Slumberers can sleep in and still enjoy breakfast favourites, while early-risers get a head-start on lunch. The Carnival Spirit‘s Empire dining room offers an elegant and relaxing setting in which to enjoy a full three course menu! It’s an experience that’s filling, but never stuffy – you’re just as likely to catch waiters table-dancing as you are to order dessert. Dessert’s included – along with the rest of your meal, by the way – in your fare. But don’t skip straight to dessert, because the main course is the main attraction; drop in daily and enjoy a rotating menu of delectable favourites, including steak, seafood and prime rib. Carnival Spirit‘s kids’ menus, available at most onboard dining venues, feature foods that are delicious enough – and fun enough – to satisfy even the pickiest of eaters. We’ve got all the familiar options they love at home, like spaghetti and meatballs, chicken nuggets, hot dogs, mac-n-cheese, peanut butter and jam sandwiches and – yes mum – fresh fruit and veggies. They should save room for dessert, though, because with sweet stuff like banana splits and chocolate brownies, your young’uns are going to be pretty excited. There’s even 24-hour pizza and ice cream…but these are subject to bed-time, of course. Why not treat yourself to a latte, macchiato, cappuccino or whichever coffee takes your fancy, as Carnival Spirit‘s onboard baristas, professionally trained in Aussie coffee brewing techniques, serve up your favourites. It’s everything they love about summer camp and their favourite babysitter, all in one! Camp Carnival offers tons of activities designed for children in three different age groups: 2 to 5 years, 6 to 8 years, and 9 to 11 years. When it comes to complete relaxation from the inside out, nothing beats a trip to the spa. From the minute you step inside, the soothing ambiance begins to work its magic. Play it again, Sam. Or Diana. Or whatever your name is. Because this is the bar where you call the shots – and the songs. Pull up a seat, order your favourite cocktail, and let your friendly piano player know which songs you’d like to hear. There’s chuckle-funny, then there’s laughing-so-hard-you-can-barely-breathe funny. To take our Punchliner Comedy Club talent way over the top, we’ve teamed up with renowned Aussie comedians who are certain to take you to the point of mirthful hysterics. You’ll find yourself with sea breezes, swaying hammocks and, of course, a nearby bar. It’s the place to get done the kind of stuff you just can’t seem to do anywhere else – reconnect with your partner, finish that book, lavish some spa time, or do absolutely, blissfully, nothing at all. Wanna splish – and splash – the day away? Head on over to Carnival Spirit’s WaterWorks, her onboard waterpark. First up, there’s Carnival Spirit‘s Twister Waterslide, hundreds of feet of spiralling awesomeness that starts you off high in the air and gets you down low with one of the fastest, wettest rides you’ll find anywhere. If that’s not enough, try Green Thunder, the steepest waterslide at sea at 65kms an hour! Set your sights on the winning post with this unforgettable round trip to the Emirates Melbourne Cup. With exclusive special events from Sydney to Melbourne, you'll arrive in time for all the festivities of the Race that Stops the Nation. Your ticket includes general admission entry into Flemington on Melbourne Cup Day (plus transport to and from the racecourse) and general admission entry into Crown Oaks Day (transfers extra). Don't forget your frock, fascinator and form guide!